Chinese crane manufacturer XCMG has displayed two QY25K-II cranes at an exhibition in Ethiopia, where the company’s cranes are also currently completing the construction of a shopping centre. At the recent Eleventh International Construction Machinery Exhibition, held at the Ethiopian capital of Addis Ababa, XCMG’s local division also showcased its ZL50G loaders, XMR082 rollers, and GR180 and GR215 graders. 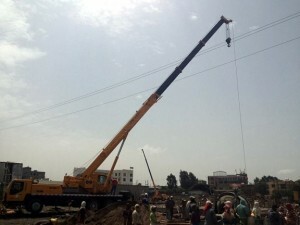 XCMG’s QY25K-II cranes are currently working on the ENDA shopping centre construction site in the city, one of a number of similar projects launched by the Ethiopian government in recent years. XCMG’s cranes are also being used on the National Grid Project in the country, initiated following rapid growth of the national economy. The Chinese manufacturer, meanwhile, has also adapted its QY25KS truck crane for arctic conditions. The crane has passed Russian OTTC certification and is suitable for operation in temperatures down to -40°C.